This week, Stephen Ibaraki, FCIPS, I.S.P., ITCP/IP3P, MVP, DF/NPA, CNP, FGITCA has an exclusive interview with Ajit Jaokar. Ajit Jaokar is the founder of the London based research company FutureText which specializes in identifying and researching cross-domain technology trends. In 2009, Ajit was nominated to the World Economic Forum's 'Future of the Internet' council. In 2011, he was nominated to the World Smart Capital program (Amsterdam). 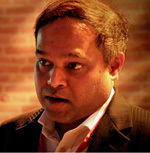 Ajit moderates/chairs Oxford University's Next Generation Mobile Applications Panel and conducts courses at Oxford in the next generation Telecoms trends. In 2012, he was nominated to the board of Connected Liverpool — Resilient Liverpool programs — based in the city of Liverpool for their Smart city vision. His consulting activities include working with companies to define value propositions across the 'converged stack'. Ajit has worked with a range of commercial and government organizations including in strategic and visionary roles. Since May 2005, he has founded and run the OpenGardens Blog which is widely respected in the mobile/telecoms industry. Ajit has spoken at many conferences which include MobileWorld Congress (4 times), CTIA, CEBIT, Web20 Expo; Java One; European Parliament; Stanford University; MIT Sloan; Fraunhofer FOKUS; University of St. Gallen (Switzerland). Ajit follows and studies white space networks as part of his PhD. Ajit is the founder of the ed-tech start-up www.feynlabs.com. Feynlabs is the first initiative to teach the concepts of programming languages to kids (as opposed to a specific programming language). By abstracting the common elements of programming languages, our aim is to rapidly learn any programming language. We have more than 40K fans on Facebook and covered in major tech-ed publications. We are running trials in Europe and North America. All our content will be always open sourced and also free for schools. Feynlabs was founded on inspiration by Ajit's then seven year old son Aditya Jaokar (now nine years old). :00:27: You are involved with the World Economic Forum (WEF), can you share some of your experiences? "....My involvement in the World Economic Forum was with the 'Future of the Internet' council....When you look at the future of the internet most people realize that the internet evolved organically, there was no structure, no planning behind how the internet evolved, but now that it has matured the discussion on what happens, where it goes forward and where the ambiguities lie tend to be in terms of government, corporates and individuals. My personal view is about what is essentially the freedom of the internet which is a platform to be kept away from any particular entity...."
:02:50: You talked about the freedom of the internet and its future. There are some countries who really want some regulation and governance over the internet and more government involvement. Can you comment on this and do you think that controversy will ever be resolved? "....Whatever side you are on, our policy makers today are reluctant to come out too much in favor of controlling the internet....I think technically it is possible to exert a level of control on the internet (as much as most people would not want that to happen). What is at stake or what is the discussion is from a regulatory perspective and from a global perspective on that regulation...."
:07:05: Can you talk about the World Smart Capital program, your involvement in it and what you hope to accomplish? "...The role I play in that is in an advisory board role (advisory board primary function is to look at the criteria for understanding smart cities and as well deciding which smart cities are every year). We are still early stage so it's pretty much a role of deciding intellectually what the smart city is....I work with cities or city officials more than with specific vendors and that makes quite a big difference because vendors who approach smart cities tend to approach them from a technology perspective....City planners tend to look at completely different arguments, they tend to look at urban immigration, green issues, pollution...."
:11:03: You also have involvement with the Oxford's Next Generation mobile applications program. Can you outline what the program is about and what you hope to accomplish? "....The idea was (what I call) 'an intellectual watering hole' for thinkers. On the internet there's not a lot of places to have real discussions or in-depth discussions about issues mainly to do with mobility, the future of mobility and the impact on people....We try to get the best thinkers on the forum and let the discussion happen and similarly with the conference. It's very much unscripted conferences which do not have any conference sales pitches and people come and have a great time as well...."
:12:53: What are new trends in Smart Cities and the top two city models to emulate? Why? "....The first one is certainly on people's radar: Barcelona....which has already built up on its core strength which happened to be the Mobile World Congress held there every year, and then extended that into parts of the city where there are specific areas earmarked towards some trial and deployments and things like that....The second model to emulate which is not in the spotlight, but which I work much more closely with is the Liverpool model....The Liverpool program is run very differently, it's run from the perspective that it's a city which has some level of unemployment and so on. It's run in a very human perspective...."
:16:02: Can you give some digital policy innovations for 2015? If 2015 is too far ahead, even for next year. "....I think 2015 is not far ahead for a policy point of view. I've been in policy discussions both in the EU and in the US. If you look at the mobile handset cycles and if you look at those numbers then you can pretty much see what's going to happen...."
:19:01: What will be the features of open systems for 2015? "....To put it into perspective, my definition of open first of all has to be a platform (by that I mean others can add value to their systems), and that clearly has to have an economic model which is a classic platform model. The second definition of an open system from my perspective is that the system not be controlled by an entity....If you take this idea of understanding open systems in that perspective I think the 2015 arguments will focus around a few things, the first one being how the existing web players define openness...."
:21:42: What are some top cross-domain technology trends? "....Possibly the most important one is mobility, but I use that in a specific context of mobile-first....The second is the change in the enterprise and that is specifically when you take mobility and social media to the enterprise (everything else has come from the enterprise to the consumer, whereas mobility and social media are flowing in the opposite direction)....The third one is what is called the internet of things, the machine to machine...."
:24:13: What are the top mobile strategies for 2015? "....The hybrid app....Mobile payments in some shape or form....Those two will drive a lot of technology and consumption and some of that is already being played out...."
:25:42: Are there any lessons that you can share from your recent conferences and your involvements with them? "....My experiences are that the conferences themselves are evolving as business models, but they are evolving in these two directions that is very large conferences or very niche ones and both are good...."
:28:18: You are also involved with Feynlabs, can you outline what Feynlabs is about and why it works? "....The ideology of Feynlabs is in a sense a pedagogy, a way of teaching. I wrote a paper about it which was published in a US Journal and education journal and we've been developing the methodology working with trials in schools in Europe and in the UK....The idea is that when you finish the program you are able to master any programming language because you are able to understand what's common across the different languages...."
:32:31: You are deeply involved in the education space and we can see that with Feynlabs. What do you think education will look like in 2020 or 2025? "..... In the case of education I think the rate of change is dramatically escalated....and this is in the massively open courses and things like that and at institutes like Stanford and MIT, etc....When we look at these platforms and technologies what does it mean for somebody to have learned something? That's the real question and that's where education is evolving. The other area of education that's evolving is how do you prove what you know...."
:35:13: How is ICT infrastructure evolving? "....My personal view of ICT infrastructure (which may not be agreed to by everybody) is that the value for ICT is changing significantly. If you look back at its history it was very clear cut— you either made a hardware product of some kind or you made a software product of some kind and you sold that at a cost or a license. The challenge today is the value across the stack is moving in different ways...."
:39:20: What are the main challenges faced by enterprises and governments today because of this rapid change and changing demographics? "....I think that the key challenges that enterprises and governments face is how to manage the rate of innovation...."
:41:24: From your point of view what company policies need to be implemented to foster innovation? "....I think the biggest driver to innovation is to help incorporate diversity into your culture, assuming you are in an industry which is at a faster rate of change...."
:43:04: What kind of resources do you use to stay on top of things, stay informed and to be agile? "....My way of thinking and being agile actually is to follow people as opposed to companies. I tend to look at specific people who I follow, and by that I mean even those with views where I don't agree. I think there's a lot to be gained by understanding diverse perspectives...."
:45:10: Can you describe some areas of controversy in the areas that you work? "....The areas of controversy in terms of topics and domains tend to be people who have certain views and you find them on both sides of the fence....There's the classic piracy and there's the classic privacy problem that could be viewed as a controversial or not...."
"....The real question is if that should extend across to all of IT. I think that's harder to do for the very simple reason that the rate of change is very high, much higher than any other industry we have seen before, so it's hard to compare IT to accounting for example from the certification perspective....I think there are certain segments of the IT industry which do require certification and that certification is already happening through vendors and through industry bodies...."
:00:00: Ajit share some stories from his extensive speaking, travels, and work (something amusing, surprising, unexpected or amazing). "....The most interesting thing that I find when I'm travelling is the kindness of strangers and it never fails to amaze me...."
:52:08: If you were conducting this interview, what questions would you ask, and then what would be your answers? "....Can you comment on the very rapid change in innovation coming from emerging markets?....How has the meaning of research changed in today's world?....Can you comment on singularity as a disruptive field?...." :55:08: Ajit, with your demanding schedule, we are indeed fortunate to have you come in to do this interview. Thank you for sharing your deep experiences with our audience.